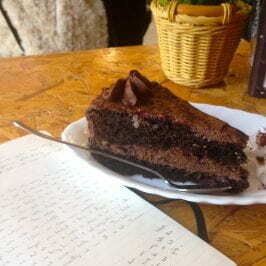 Blog honesty moment: I’m writing this post instead of working on my art history paper. The paper that I’ve barely started. The paper that’s due in, approximately 36 hours. Now at Amherst, I’d be gnawing my elbow off with worry about that paper. But here abroad? It’s not bothering me too much. I know I’ll get it done. It probably won’t be as polished as the papers I turn in at Amherst, but that’s ok. Before I went abroad, people told me that learning this semester wouldn’t take place in the classroom, it’d happen through trying to navigate a foreign country and language. So this weekend, knowing full well that I had seven pages to type out, I boarded the high speed train and got off two hours later in Valencia, arriving the day before the close of Las Fallas fire festival. 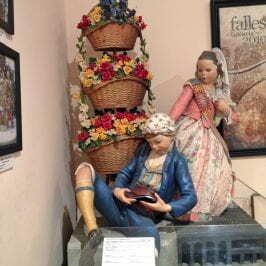 During Las Fallas, the city displays giant elaborate statues that are built through the year. Each neighborhood creates a fallas statue, and sometimes a second children’s fallas, out of paper mache, wood, and whatever else is on hand. They’re often funny and satirical (though much of the satire of Spanish politics was lost on me), and are really quite impressive. During the week of Las Fallas, there are fireworks displays every day and the air is constantly peppered with the sound of kids and teenagers setting off firecrackers. People party in the streets until daybreak and the smell of frying churros and thick-cut chorizo sausage wafts out from the street vendors and cuts through the smoke. 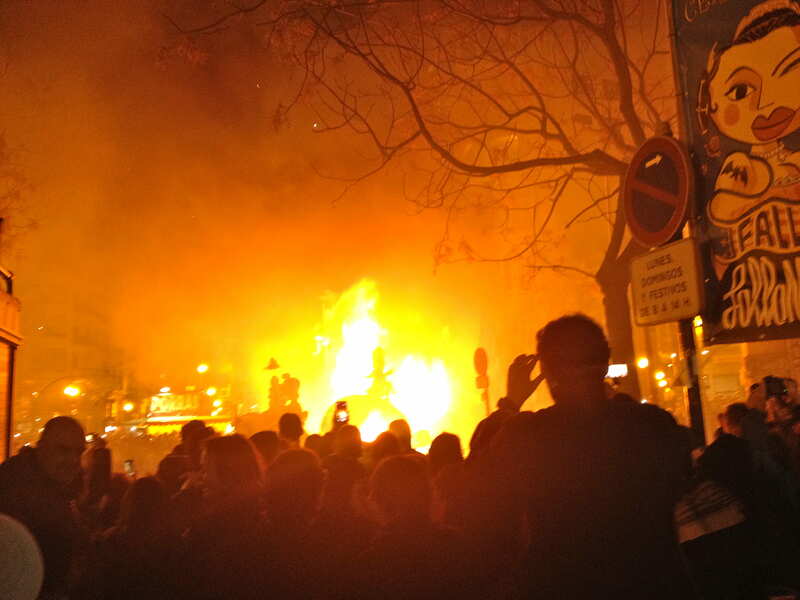 On the last night of the festival, the fallas statues are lit on fire at midnight. They go up in a huge blaze of smoke as fireworks burst and flower overhead. My friends and I got off the train in Valencia and immediately heard the boom of firecrackers. We ran into statues down nearly every street as we made our way from the train station to the hostel. The walk took much longer than it needed to because we spent so much time posing like the statues! 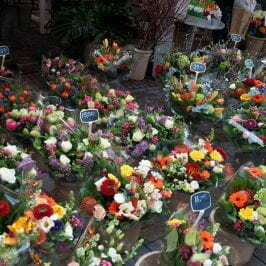 The next day was the closing of the festival. The streets were mobbed with people. Local kids wore wooden boxes full of firecrackers on a long strap around their necks, and would stop at street corners to light the crackers and throw them into the crowds. Safety regulations? Not much of a thing here. At 2pm the masses gathered in Valencia’s central square for a firecracker display that was intended to imitate an earthquake. The square rumbled and shook as the sounds exploded all around us, coming faster and faster as the crowd held their breath and cheered in equal measure. By the end it felt as though my lungs were going to explode with the sound and vibration. While the smoke cleared, excitement hung in the air. Parades marched through the streets, people dressed in elaborate traditional clothing. Women tucked iphones into their lace hoopskirts and teenagers with elaborate braided hairstyles swapped lipstick and compact mirrors. Finally, midnight came. My friends and I stationed ourselves near a small fallas so we could be at the front of the crowd (the bigger the statue, the bigger the crowd). Our statue was drenched in kerosene, then lit. First came fireworks, launched right above us and showering us with color. Then the statue caught in earnest, and went up in a billow of smoke and flame. Turns out we’d chosen our positions badly, and were quickly covered in thick black smoke and ash. The firefighters (who are stationed at every fallas) started spraying down the surrounding buildings, and the mixture of soot and water rained down. The whole city seemed to be coughing and laughing and dancing. Once the first statue burned to the ground, the crowds began to make their way back to the central square where a giant lion statue would be burned at 1am. Finally the final firework display shot into the sky, and below, the huge lion began to burn. Once again the world was color and fire and booming sound. Then five minutes later it was gone, flickering away and leaving us to traverse the ashy streets with our ears still ringing. Of course I got back from Valencia and still had seven pages of my Art History essay to write. But I’m so glad that I got to stand beneath those pillars of fire and watch as the sparks rained down. I’ll stay up late tonight typing out my paper; I’ll accept that my sentences may not be perfectly crafted. There will be papers again, more pages to write, and this will not be the only time I type against the clock. 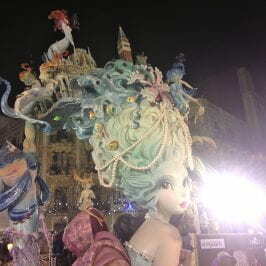 I’m not sure though when I’ll have another chance to witness the spectacle of Las Fallas. 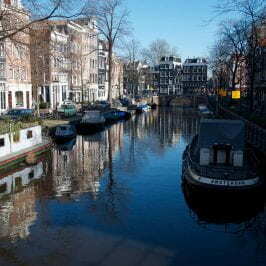 Study abroad is a balancing act, and too often it feels like the very name is a contradiction. Study and abroad? Both? At the same time? At this point in the semester, I’m feeling like my time in Europe is slipping away fast. A few late-night hours of writing seems like a small price to pay to have witnessed the spectacle of fire.